** Pricing is Per Person twin share, including all taxes. Offer subject to availability at time of booking. Prices are per person based on best available cruise fare, inclusive of all discounts unless otherwise stated. Prices are subject to currency fluctuations and are based on cash or cheque. Cruise deposit, amendment and cancellation conditions apply. Special conditions apply - please ask for full details at time of enquiry. Outside Cabin prices quoted, can also include Obstructed Cabins. Cruiselines Terms & Conditions apply - Please ask us for details. 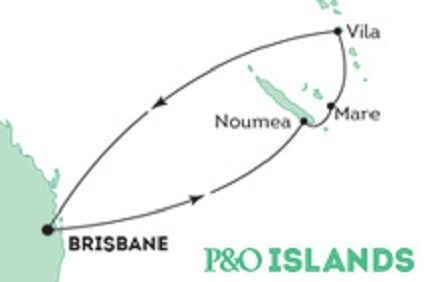 7 Night Cruise sailing from Brisbane roundtrip aboard Pacific Aria. Thanks to our newest members, Pacific Eden and Pacific Aria, we’re now the largest fleet (or should we say family) in Australia. Pacific Eden and Pacific Aria will offer a whole new level of innovation. From gourmet dining to live music venues and a completely redesigned pool deck. It’s cruising like you’ve never seen it before. Brisbane is the capital and most populated city in the state of Queensland, Australia. It is situated at a bend of the Brisbane River, approximately 23 kms from its mouth at Moreton Bay. The city itself is very hilly; the CBD is only 2.2km and is easy to walk on foot. Popular tourist and recreation areas in Brisbane include the South Bank Parklands, Roma Street Parkland, the City Botanic Gardens, Brisbane Forest Park and Portside Wharf. The Lone Pine Koala Sanctuary opened in 1927 and was the world's first koala sanctuary. Other attractions in Brisbane include galleries, wildlife parks, museums, markets and adventures. Visitors can relax at beautiful beaches and explore the river, bay, parklands, forests and mountains. There are festivals and events galore too. Nouméa is the capital city of the French territory of New Caledonia. It is situated on a peninsula in the south of New Caledonia's main island, Grande Terre. It is one of the most westernized cities in the Pacific islands, and while the city itself is not attractive, there are some beautiful beaches on its outskirts. Attractions in Nouméa include a stroll along the Place des Cocotiers, the local produce market and the Tjibaou Cultural Centre, located 20mins from the city. The focal point of the city is Coconut Park with its attractive colonial houses and beautiful hibiscus and bougainvilleas. The marina is worth a visit and there are attractive beaches at Anse Vata, Baie des Citrons and at Pointe Magnin. Port Vila is the capital and largest city of Vanuatu, situated on the south coast of the island of Efate. The town is located around a magnificient natural harbour which offers views to nearby Iririki and Ifira islands. It is the only town on Efate and is regarded as Vanuatu’s international gateway and its main economic and commercial centre. Port Vila is a clean and attractive city with friendly locals. The waterfront and hillside area offer some great restaurants with a wide variety of cuisines. There are plenty of shops, cafes, markets, and sightseeing tours to take. Tours to Mele Village, Cascades Waterfall and the Mele Botanical Gardens and Cultural Centre are very popular.